"All the time I was praying ‘God, I came to Addis to change the life of my family. Are you going to end my life here? Please save my life.' My prayers were answered. I thought I would die for those few minutes, but I think I was given another life." - 2010 Virgin London Marathon champion Tsegaye Kebede talking about a runaway bus crash that almost killed him several years ago in Ethiopia. 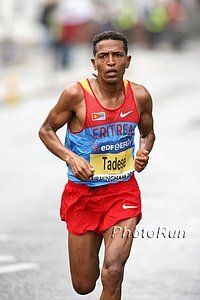 Born 5th in a family of 13, Kebede has now run 2:05:20 or better 3 times and has an Olympic and World Championship medal. Lagat gets beat at Drake! LRC Penn Relays Saturday Recap - 54,000+ Watch Bolt, Andrews, Wright and More Read about the Robby Andrews/Andrew Wheating anchor battle, Phoebe Wright's gutsy weekend, David Torrence shining in the DMR and all the other splits, security guard tackles and gems you don't want to miss from an action-packed weekend at Penn Relays, including a HS 4x1 faster than most countries' national teams. LRC Kebede and Shobukhova Shine Move over Sammy Wanjiru, Tsegaye Kebede is now the top marathoner in the world as he powered away from one of the greatest men's fields ever assembled to run 2:05:19 in London. 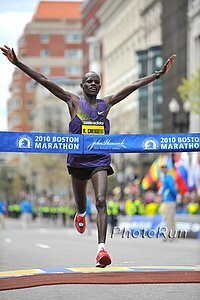 The men's field went through halfway in a conservative 1:03:06 and then Kebede and World Champ Abel Kirui asserted themselves running sub 29 minutes from 20k to 30k. Kirui would pay the price and fade, but Kebede was on his way to a dominating victory. He was so dominant it was a bit anticlimatic. On the women's side, Liliya Shobukhova backed up her Chicago win with the win in London, giving her a commanding lead in the World Marathon Majors. 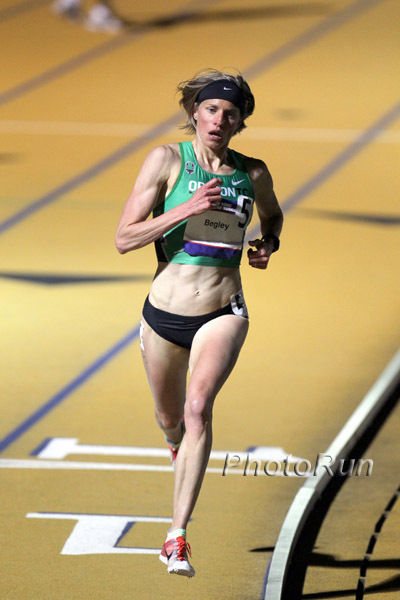 American Deena Kastor could not even stay with the leaders through 10k, and finished in 2:36. 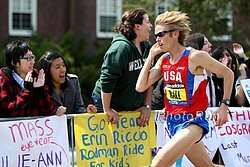 America's Golden Girl has not run under 2:28 in a marathon in 4 years, but already has an appearance fee to run this year's ING NYC marathon. Lagat Gets Beat In Mile At Drake! LRC London Women's Preview - Best Field Of The Year, Chance For New Star To Be Born Proven stars, aging greats and wanna-be household names make up what surely will be the best women's field of the year. World Marathon Majors champ Irina Mikitenko and Chicago champ Liliya Shobukhova face World Champion Bai Xue and a host of challengers, including American Deena Kastor and Kiwi Kim Smith.